New Series: Preparing For Summer At The Beach House! Since spring is finally here, we can’t help but feel like summer is right around the corner. This will be our first legit summer using our beach house (last year we were still tiling all three bathrooms well into Labor Day) and our goal is to spend lots of time there, both to whittle down our to-do list and TO ACTUALLY ENJOY THE BEACH. But in all the work we’ve been doing to prepare the house for our first summer, we realized we’ve been neglecting to prepare something else: ourselves! All of the fast food we’ve been eating on our drives there and back have only been made worse by the workouts we’ve missed over and over due to being out of town or just simply being too worn out from house projects. So in these last couple of months before Memorial Day, we’re recommitting ourselves to getting into better shape for summer. 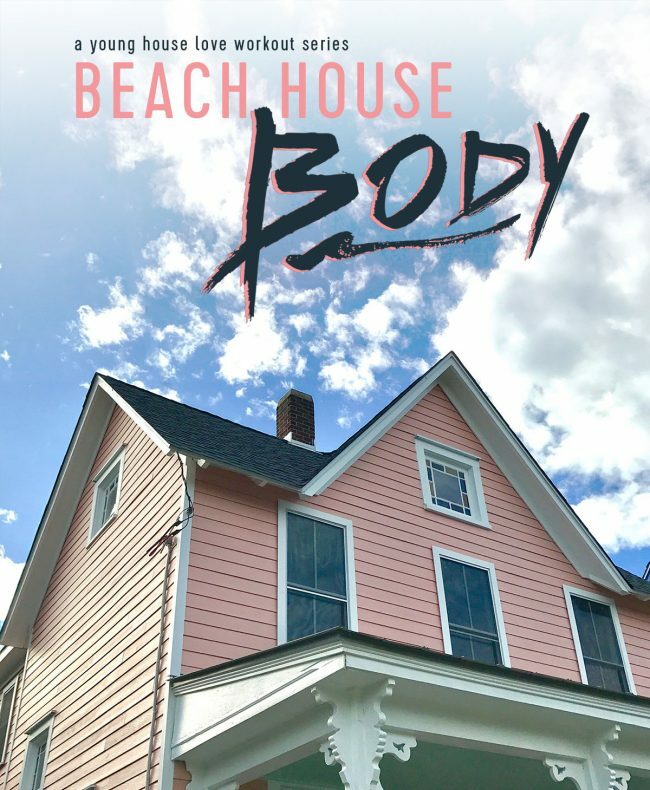 And we’re inviting you guys to come along with us in a new series we’re dubbing: Beach House Body. We’re not fitness experts (and certainly not fitness models) but isn’t that part of the fun? Who wants to watch bodybuilders and athletes with perfect form when you can watch regular people who sometimes hold the barbell wrong? It’s approachable fitness at its finest. We’ll be releasing a short video each Saturday leading up to summer with some of our favorite ways to stay fit. They’re all designed to be beginner-friendly and fun for average folks like you and me. And to get everyone pumped up for its kick off next weekend, we threw together a short preview video. So crank your speakers to 11 – nay, 12! – and hit play. You can view it below or here on YouTube. Note: if you’re viewing this post in a reader, you may need to click through to the original post to see the video. I promise it’s worth it. But in case you can’t tune in right now (you’re missing out!) here’s a preview of the types of exercises we’ll be covering. We’ll kick things off with standard gym fare like strength training and core work. Then we’ll mix it up with some lower intensity yoga, followed by some high energy aerobic stuff. The move below is a Sherry favorite. It works those all-important paint-rolling muscles. But just in case you’re thinking “snore, I’ve seen these moves before,” we were sure to incorporate bonus exercises that are specifically tailored to DIYers like us. Who needs a kettlebell when you’ve got a spare paint can hanging around?! As the old saying goes: the fuller the gallon, the better the workout! We actually sourced a lot of our “weights” from our garage. Gotta love repurposing! I’m used to lugging our tool bag around, but incorporating a walking lunge was an exciting spin on an otherwise ordinary movement. And Sherry discovered that lunges are a lot more fun when you carry a box of tiling supplies. Who knew?! The series is designed to be a complete set, so be sure to stick it through to the end – and remember to go back and watch the video for all the exciting info whenever you have a spare moment. Our workouts get very, um, creative by the end. I’m sure some of you were onto us as soon as we mentioned Sherry working out (podcast listeners know she prefers “accidental exercise”) but we hopefully got a few of you for at least a second. While we definitely could stand to get back to more regular exercise and less fast food, I can promise that’s not a “journey” we’ll ever be subjecting you guys to. But if you’d like to be subjected to more April Fool’s shenanigans, here are the links to our past pranks. This year marks our tenth year of ridiculousness! Hope you all have an awesome April Fools Day and an even better Easter! #91: When Is A House Change You Made Bad For Resale?